Gracias is a city in the Honduran department of Lempira. Take a taxi to the main bus station. Buses leave from the main bus station (La metropolitan). There are direct buses to Gracias (not that fast and luxury) or take a fast bus to Santa Rosa de Copan and from there whatever bus to Gracias. There are buses at least every 1/2 hour. The last bus from Santa Rosa to Gracias leaves at 6 pm. Take a bus to La Entrada de Copan, then a bus to Santa Rosa (preferably a fast bus) and next to Gracias. Takes about 4 h alltogether. Take a bus to Gracias and if not available a bus to San Juan. From San Juan there are buses to Gracias. If there are no buses anymore then hitchhike. Whoever travels that way will take passengers. Expect to pay a small fee. It is safe and beautiful. Minibuses from the (large) bus terminal in La Esperanza are frequent, and the journey takes a couple of hours. Costs around 100HNL. To get to Gracias from Tegucigalpa, take a bus to La Esperanza (Buses Santa Carolina, leaving from Comayaguela roughly every hour from 05:00; 120HNL). 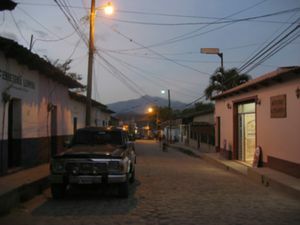 Most of the town of Gracias is accessible on foot. If you have a lot of stuff to carry or you don't want to walk, there are red mototaxis everywhere that you can hail from the street. You can see the fort "El Castillo San Cristobal" on the west side of town on a small hill. Allthough the main entrance on the south side there is a small entrance at the end of the stairs leading to the Hotel Guancascos. No entrance fee The San Marcos Church is next to the fully renovated Central Parc. The La Merced church is one block north and one block east from the “parque central". It's the older church in the city. It was construited by mercedaris, one catalan catholic order. The San Sebastián Church, in the San Sebastián Park. The Santa Lucia Church, close of the soccer pool, direction to National Park. The market is 2 blocks west of Central Park. You will pass the “sweets, spicy and pickles’ shop” if you walk from Central Park to the Plaza San Sebastian. Ask for Lorenas her shop.•You Unfortanetly churches are often closed, only the San Marcos is used for mass on a regular base. The Fortaleza de San Cristobal above Gracias. Mostly, Gracias is nice for walking around and experiencing small-town life in western Honduras. It's a very old place with an interesting history. It's also a jumping off point for visiting Celaque. A few kilometers outside of town are the aguas termales, or hot springs, that are nice after a long hike or day of traveling. The swimming pool is set next to a nice artificial lagoon and fish pond. Termas del Rio is another hot springs site. It has a set of big pools with really nice hot water built in a natural environment. You can get there by taking the bus to Santa Rosa, La Iguala or lepaera, and get off at the Termas del Rio entrance. (about 15 min, on the main road). Walk down the private road for about 5 min. If you have your own car, drive in the direction of Santa Rosa for about 7 km and be aware of the sign and entrance on your left hand side. (You have to cross the big bridge) There are changing facilities and toilets. Sport facilities (Table tennis, volleyball, football etc) Restaurant Entrance fee: Lps 60.00 How to choose where to go? Both settings are gorgeous and good temperature pools. The advances of the Termal Baths are: Bigger pools, sport facilities (table tennis, Volleyball, football etc. More tranquil and relaxing, they sell bear but there is not a drinking environment. Cleaner and better facilities in every way Private run, good staff and the owner is often there himself The price makes up for the quality If it is a Friday night, Saturday, Sunday or a bank holiday, go to the Termas del Rio! Any other day the Arcilacapools are great. Parque Nacional Celaque. 09:00–17:00. 50HNL. editA national park containing Honduras’ highest mountain, Cerro Las Minas (2849masl, 1450m ascent). The park can be reached by mototaxi (250HNL one-way, or 450HNL return). 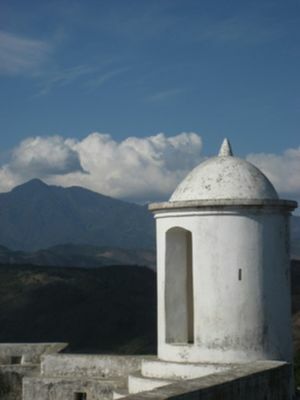 It has a small visitors’ centre (with toilets and showers), an artesania with food, and well maintained paths and signage. Entrance is 50HNL. There are multiple routes of differing lengths. To reach the summit of Cerro Las Minas, a two day hike is recommended, staying a night at one of two well maintained campsites on the mountainside. Experienced and fit hikers can summit and return in 7 hours, however 50 HNL. UPDATE JULY 2015: entrance fee 120 HNL. We got Mototaxi for 150 HNL one way. In the nearby village of La Campa, you will find Central America's highest zipline with views of the huge and beautiful canopy. The zipline costs 700 lempiras and it is well worth it. The village is very beautiful and it is one of the few places where you can get in touch with the local Lencas. You can find a hostel and a couple of hotels, but not much else. Take the bus in the morning from the central bus station in Gracias, infrequent routes but you can easily hitch hike back. Lorenas "sweets,spicy and pickels shop" , you can buy canned goods and jams. There is a cute little bar in town called El Candil. (Ask for Bayron´s place) Also the Hotel Posada Don Juan and the Hotel Guancascos have full bar services. Mini supermarkets offer cheap beer. There are several hotels in town. The most comfortable, at around US$24 per night, is Hotel Guancascos , run by an expatriate Dutchwoman named Frony. Posada de Don Juan (504) 6561020. (A luxury hotel with A/C and swimming pool). Hotel Guancascos (504) 6561219. (Comortable rooms and english spoken, tourist information). Hotelito Josue(Av Principal Dr Juan Lindo). Variety of rooms, inc. single with shared bath,(200LP) double with shared bath,(250) single and double with private bath, (300 Lp) (2016) some with TV. Cold water shower, kitchen use, quite clean, narrow garden courtyard. Really friendly staff. From the bus station, straight across the highway. Walk two blocks and then turn right. Walk another three blocks up and "Hotel Josue" will be on your right. The only way to get out of Gracias is by bus or private car. The easiest way to find the bus 'station' is to ask anyone in town. There are buses to San Pedro Sula, Santa Rosa de Copán, and La Esperanza (in Intibucá). This page was last edited on 24 December 2016, at 04:28.